What's more likely to land you an interview with an attorney - a cover letter or an awesome resume? If you said an awesome resume, you'd likely be wrong. I'm not saying that a resume is unimportant; in fact, it's crucial. However, the cover letter makes the attorney or hiring manager want to read your awesome resume and interview you. After reviewing hundreds of cover letters written by legal nurse consultants, I know that most LNCs write worthless cover letters. Let me tell you how to write an effective cover letter that's bound to get you an interview. Before I tell you HOW to write a great cover letter, let me tell you WHY it's so important. Cover letters are your first shot at selling yourself and your credentials. In addition, a cover letter allows you to identify which of your characteristics align with the firm's requirements. And most importantly, a cover letter allows you to stand out from the crowd. As you can see, there were 75 applicants for this job through Career Builder. The ad was also listed on numerous other job boards, so there could have been hundreds of other LNCs who applied for this position! 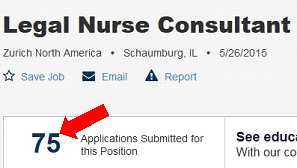 You won't stand out if your cover letter says; "I'm interested in applying for the Legal Nurse Consultant position..." because that's how every other LNC's cover letter begins. Your cover letter should start with a clear sentence about how can meet the firm's needs. Before you can do that, you need to know what qualities the firm wants in a legal nurse consultant. Here's an ad from Indeed, an internet site that consolidates job advertisements. The job ad below lists typical LNC responsibilities and skills required by law firms. This firm wants someone with several key skills and abilities. Therefore, if you were applying for this job, your cover letter's first sentence should match at least some of the key areas that the firm has identified in the ad. By doing so, you're showing the firm that you're a great fit for the job. Researched the firm and knows its major clients. Tells the recruiter (or attorney, or office manager) that she's a good fit for the job. Attaches a sample medical summary showing that even though she doesn't have legal experience, she can do the job. Asks for an interview. If you want to be aggressive, you can tell the recruiter that you'll call on a certain date to discuss the interview process. The LNC wrote the sample cover letter based on her abilities and effectively matched them to the ad from Indeed. When writing your own cover letter, you'll need to do the same with your unique attributes and match them to the individual position. Because different firms may identify different essential skills and job functions, you should tailor your cover letter to each firm.